ANZAC is an acronym for Australian and New Zealand Army Corps, the soldiers who fought in World War I. Women on the homefront did their part for the war effort by making "Soldiers' Biscuits" containing just flour, sugar, powdered milk and water, to create a sturdy cookie that stood up to shipping across the sea to their boys in arms fighting at Gallipoli. 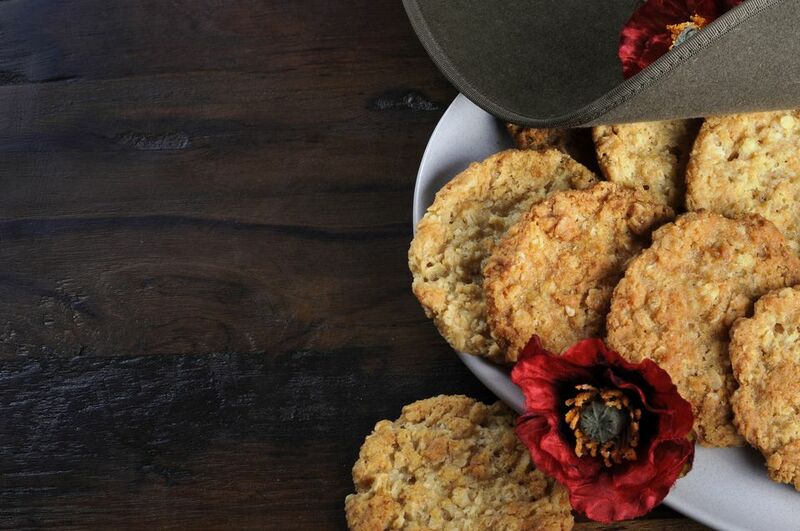 These crunchy cookies became known as ANZAC biscuits. Today, the biscuits, or cookies, have gotten a bit of a makeover with the addition of butter, golden syrup and desiccated coconut and are considered an iconic Australian food. The cookies are enjoyed year-round, but especially on ANZAC Day, a national holiday in Australia and New Zealand celebrated annually on April 25. Heat the oven to 350 F. Line a baking tray with parchment paper and set aside. In a small saucepan, melt 12 1/2 tablespoons butter over medium heat. Add 1 tablespoon golden syrup and 1 teaspoon baking soda to the butter and stir well. Remove from heat and set aside. In a medium bowl, mix together 1 cup all-purpose flour, 1 cup rolled oats, 1 cup sugar, 1 cup desiccated coconut and 1/4 teaspoon salt. Add the melted butter-syrup-soda mixture to the dry ingredients and stir with a wooden spoon to combine ingredients. Roll about 1 1/2 tablespoons of dough into small balls and flatten between the palms of your hands. Place dough on baking tray about 1.5 inches apart to allow room for spreading. Bake the biscuits for about 10 to 12 minutes or until golden brown. Remove the biscuits from the oven and let them sit on the baking tray for 5 minutes. Remove the biscuits from the tray and cool on a wire rack. Store cooled biscuits in an airtight container. The first major military action by the ANZACs during World War I was the landing of a submarine commanded by Henry Stoker on Gallipoli on April 25, 1915. The Gallipoli peninsula is Gelibolu in modern Turkey. ANZAC Day is celebrated annually as a day of commemoration for all those who died during the war.